My favorite children's book, Where the Wild Things Are inspired our nursery. We painted with Behr Premium Plus Flat. Most of the paint was from sample sizes. The Outlines were done with Black Paint Pen. The entire Sky is covered in glow in the dark stars made from premium glow in the dark paint purchased online. 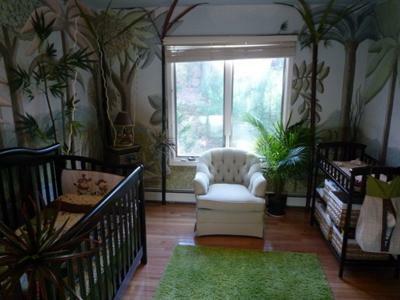 The layers of fake plants were added from Pier 1, the Crib and changing table are from Target. The Ethan Allen green chair was free off of craigslist. The Green grass like carpet is from Ikea and the Sun light on ceiling is also from Ikea. Uncle Milton's Moon in the Room is from Amazon. The nursery bedding was also purchased at Target. It took about 30 hours of work spread over a few months a little here and a little there. It was a lot of fun. I had some friends help paint the basic shapes one night after I painted the sky and drew the outlines. It feels like you're walking into a real magical forest. Staring up at the stars at night with the trees visible only as dark outlines is amazing. First prime all of the walls with primer or white paint unless you already have an even light color to paint over. Then pick up the book or whatever image you'd like to draw. I did it free hand looking at the book as a reference which is very fast - just getting the outlines up in pencil - soft lead or charcoal works. If you can't draw, there is a technique that you can use to be very good at it but it takes more time - you need to grid out the image you're drawing and then scale it up box by box. For example, your reference point could have 1"x1" inch boxes and then you draw 2'x2' foot boxes on your wall, then you just need to reproduce the lines box by box. Then when you stand back, it looks great! Don't try to set aside "a weekend" to do it. It's fine to do a little at a time whenever you feel like it! The rest is really filling in the lines with colors. Before you grid it out see what background you should do too. If it's mainly a sky background you want to do a gradient to make it look hyper real. I painted the ceiling a uniform blue, then the tops of all the walls that same blue, but then running around in a circle I painted bands of color going down 5 inches or so, adding a little bit more white each time - that makes a horizon that is very light blue, with a deep blue sky straight up - just like in real life. If you're all painted now and you've filled in all of the colors you want you might not be happy with it. Some of the lines don't match up perfectly or are jagged. Don't worry because the last step is outlining everything with a thick black "paint pen" - it erases all the imperfections between 2 colors and really makes all the foreground images "pop" from the background and seem 3D. use a small paintbrush and a step stool to spend about 5 or 6 hours painting dabs of paint ALL over the ceiling, and don't worry about doing real constellations. If you have trees on your walls and a horizon, put dabs in open sky only - this makes the trees stand out even at night. The result is a shockingly realistic 3D outdoor fantasy nightscape, and you won't need to buy a nightlight for the room. Hello, its awesome!! can you take a closer picture of all the bedding?? Thanks for the kind comments everybody. Someone was asking for advice on how to plan out a project like this. I just tried to type out full instructions here but I hit the max character limit so I'll see if I can forward my full response to the blog owner to add on to my entry above if it'll help anyone. 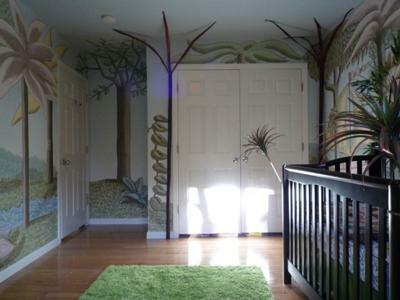 Would you be willing to fly out here and paint a mural like this for my sons nursery???? I will fly you out and pay all expenses!!! Plus Hourly rate to paint it! I LOVE IT!!! I would like to do something similar. how did you tackle such a big job? What an awesome mural - well done!